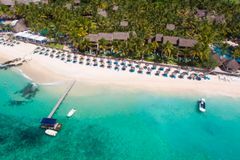 The Constance Belle Mare Plage epitomises what Mauritius is all about; delivering a perfectly relaxed and intimate resort, whilst bordering a simply exquisite beach. The resort is located amid the palm trees of the 150-acre estate, and is extremely well equipped with luxury amenities to ensure a memorable holiday. With its two awe-inspiring championship courses, the Legend and the Links courses, and an annual host on the Staysure Seniors Tour, the Belle Mare Plage shows you why this resort is arguably the most established golfing destination in Mauritius, presenting high quality layouts in an environment of unimaginable beauty. The Legend Course is the crowing glory of Belle Mare Plage's golfing arena, and was designed by South African Hugh Baiocchi. The course (6,611 yards) skirts one of the island's most idyllic beaches, and is carved through the wildlife-rich forests of Mauritius' east coast. Baiocchi's concept was realised by a construction process in accordance with USGA guidelines, and its greens are renowned for their slick surfaces. Each hole is truly unique around this most amazing course, from the legendary layout to the views of the famous Mauritian coastline. Added to the Belle Mare Plage Resort in 2002, the Links Course measures 6,518 yards, and was designed by Rodney Wright, in conjunction with golfing legend Peter Alliss. The par-71 layout has matured nicely since its inauguration, and has helped to ease the traffic around the famous Legend Course. The same water features and woodland help to provide beauty and challenge. With the club house in sight, golfers have to hold their nerve to carry the water that guards the final green at this magnificent resort course. Pluck up some courage at the Legend's 17th - the island green is perched atop a volcanic outcrop, bathed in the beautiful aquamarine of the Indian Ocean. The accommodation is comprised of 92 sea-facing Prestige Rooms and 137 Sea View Suites, all of which are complete with a private balcony or terrace, air-conditioning, satellite television, direct dial telephone, safe deposit box and a seating area. Suites have a separate seating area, as well as a whirlpool bath, and add that extra bit of luxury to your golf holiday in Mauritius. There are also 20 Garden or Beach Pool villas as well as a Presidential villa which is located on the beach providing magnificent views of the sea. In addition to the myriad of leisure activities and pursuits, and the obvious splendour of the beach, Belle Mare has an enviable reputation for its impeccable levels of service, which is why it is established as such a Mauritius favourite. The prestigious Shiseido Spa is focused not only on cosmetic beauty, but a total goal of complete wellbeing, offering treatments aimed at harmony of body and mind. The nearby health and fitness centre boasts a sauna, steam bath, plunge pool, jacuzzi, and an aerobic studio which schedules classes including yoga. There is a Constance Kids Club for ages 4 to 11, while you can play tennis, squash and boule. The fabulous beach is a favourite with water sports enthusiasts, where you can try activities including kayaking, sailing, water skiing, windsurfing, scuba diving, parasailing and sport fishing. Get the best view of the underwater tropical wildlife by going on a complimentary glass-bottom boat trip. Among the many dining options, La Citronelle is the main beachside restaurant, while the gourmet a la carte menu in the Blue Penny Café "Gourmet Restaurant" is renowned. Belle Mare Plage has no less than 6 separate bars, with one for every occasion. This is a beatiful hotel on the beach with great facilities, but visitore must go all inclusive otherwise it is very expensive. Unfortunately I had requested ground floor suite we were allocated a second floor suite and though it was perfectly adequate both my husband and I struggled with the steps. As for everything else we both felt that the management had certainly improved the whole complex since we were last there. Particularly the quality of food in the al la carts restaurants. Very comfortable, very clean, Staff excellent, friendly and very efficient. Hotel is very well laid out and kept in great condition. Beach cleaned early every morning before the guests went on. Excellent sport facilities--water, tennis, golf. Our stay ticked all our boxes and would go back. This one of the best hotels I have ever stayed in. the service and the staff were fantastic. Must holiday for everyone and anyone. A fantastic first visit to Mauritius. The hotel, courses and all YGT arrangements were great. The staff at Constance Belle Mare Plage could not do enough to make our stay so memorable. Thanks YGT and all at the hotel, Legends and Links. Compared to the Legend I didn't do so well on the Links. A more open course with lots of boulders however still an excellent golf course to play. Played twice, one time being the weekly Shotgun Texas Scramble run by the Staff--great fun day. The word was that this was a tight and quite difficult course. Played it twice--once under my handicap (13) and once just over. I thoroughly enjoyed the course and it seemed to suit my play--my wife also enjoyed the Legend--also playing very much to her handicap. Staff excellent. Clubs cleaned and either stored on sight or taken to the Links for the next game. Great course with a lot of water. you will need a lot of balls if you have never played this course before. Great staff and service. Great course with a lot of water. you will need a lot of balls if you have never played this course before. Tricky course but after a couple of rounds and better course knowledge of the water hazards, rocks and hole layouts our concern over our ball supply lessened! Visiting in September was great for us with temperatures in the mid to high 20°s. The course was not busy so we played in a two ball at our own pace. Plenty of water hazards, you will lose a few balls, deer on course which is nice... preferred the Links course though.